Thanks to Dr. Sean Williamson, Henry Ford Health System, Detroit, Michigan (USA) and Dr. Matthew Wasco, St. Joseph Mercy, Ann Arbor, Michigan (USA) for contributing this case, and Dr. Williamson for writing the discussion and Dr. Debra Zynger for reviewing it. To contribute a Case of the Week, first make sure that we are currently accepting cases, then follow the guidelines on our main Case of the Week page. (1) Thanks to our visitors at the recent CAP conference for their support and feedback. We have posted testimonial videos on our YouTube page and posted pictures on our Facebook page. (2) The Jobs page displays regional totals by subspecialty at the bottom of the Search Jobs section, as well as Jobs by location, subspecialty, organization and date posted. (3) We now update the Parasitology chapter based on the great cases in the blog Creepy Dreadful Wonderful Parasites by Dr. Bobbi Pritt, Mayo Clinic. A 16 year old girl from Africa (no further history available) underwent partial nephrectomy for suspected Wilms tumor. The specimen contained a 3.9 cm tan, mixed solid and cystic nodule. Which immunohistochemical marker is best for distinguishing juxtaglomerular cell tumor from renal glomus tumor? Juxtaglomerular cell tumor is a rare renal neoplasm that produces renin, often associated with uncontrolled hypertension that can resolve upon resection. These tumors are thought to recapitulate the specialized smooth muscle of the juxtaglomerular apparatus and predominantly occur in young adults (Diagn Pathol 2011;6:80). They are characteristically positive for renin (Hum Pathol 2013;44:47, Arch Pathol Lab Med 2006;130:707), and are often positive for the nonspecific stains of smooth muscle actin, vimentin, CD34 and KIT, and negative for epithelial markers. 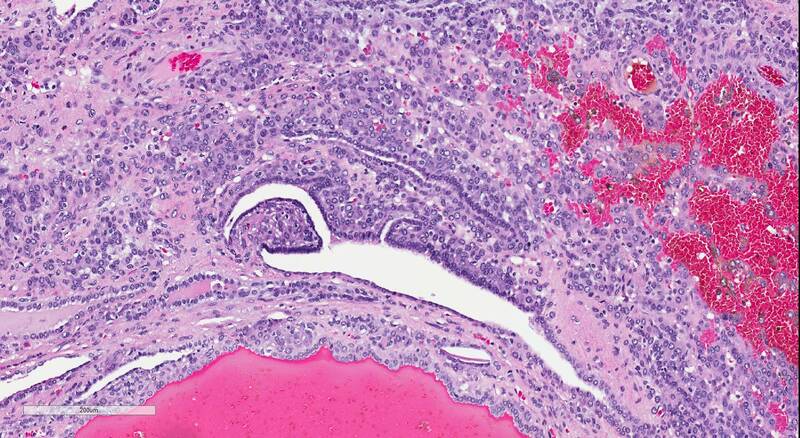 As illustrated in this case, a subset of cases have a papillary component. 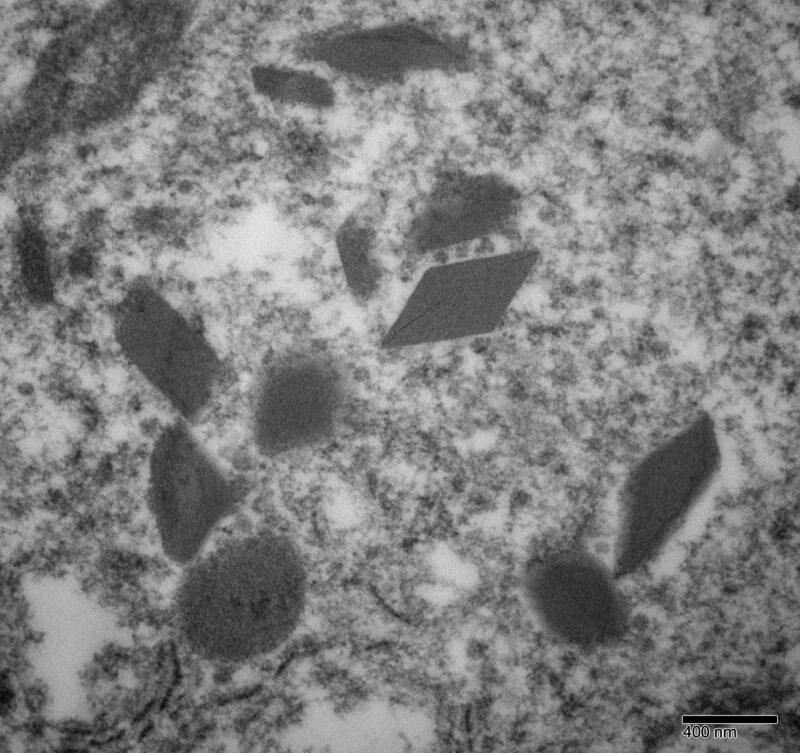 With electron microscopy the characteristic finding is rhomboid renin protogranules (Diagn Pathol 2011;6:80). The differential diagnosis includes the myopericytic spectrum of tumors, most commonly manifesting as glomus tumor, which is the closest mimic (Hum Pathol 2017;64:106, Am J Surg Pathol 2007;31:585). Renal glomus tumors, in contrast to their soft tissue counterparts, are often substantially larger, forming a sizable mass that would be clinically suspicious for renal cell carcinoma. Distinction between these entities can be challenging, as both have similar solid architecture and uniform cytology and lack a specific immunohistochemical profile (Int J Urol 2011;18:871). Clues to the diagnosis of juxtaglomerular cell tumor include papillary architecture (when present), not described in renal glomus tumor, and renin staining, which is typically but not always negative in glomus tumor (Hum Pathol 2017;64:106). Rhomboid renin protogranules by electron microscopy are characteristic for juxtaglomerular cell tumor. In contrast, glomus tumors contain myoid filaments ultrastructurally (Hum Pathol 2017;64:106). 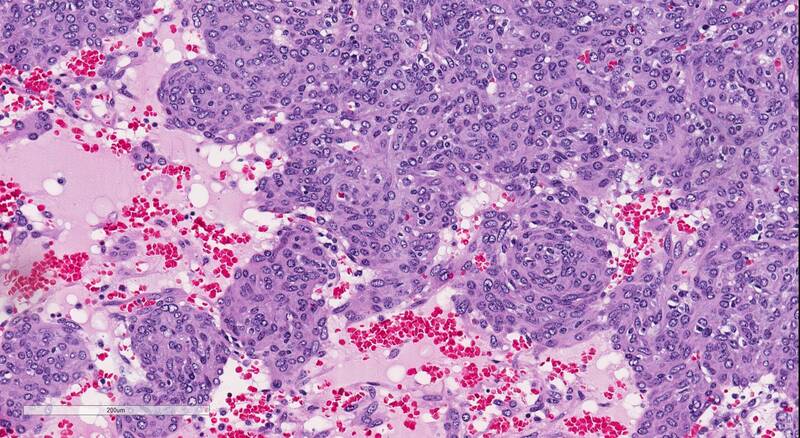 The differential diagnosis also includes the solid variant of papillary renal cell carcinoma, which is positive for cytokeratin, PAX8 and diffusely strong for alpha-methylacyl-CoA racemase (AMACR). Additionally, some epithelial differentiation is typically appreciable morphologically, such as tubular structures or nests. Wilms tumor (nephroblastoma) could also be considered, but would be more proliferative with mitotic figures, and often exhibits at least 2 components prominently of the classic triphasic appearance (blastema, stroma and tubules). 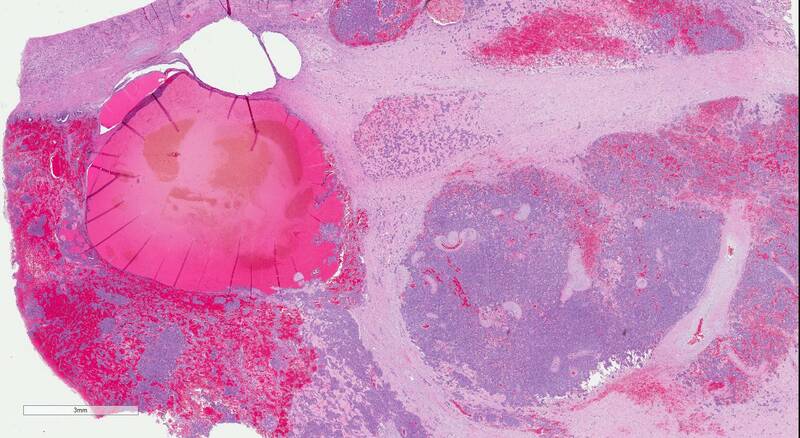 Conversely, juxtaglomerular cell tumor lacks the cytologic atypia seen in the blastemal component of Wilms tumor. Nephroblastoma is also positive for WT1 immunohistochemistry. 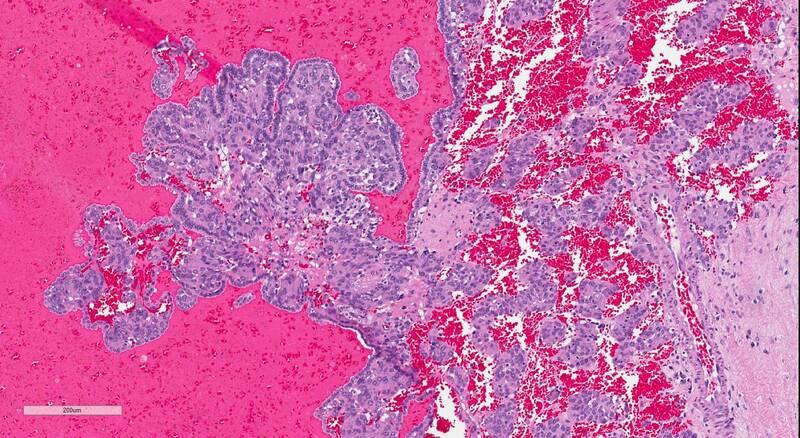 A fourth diagnostic consideration is mixed epithelial and stromal tumor. In these neoplasms, the solid component is typically less cellular and composed of spindle-shaped cells, which are usually reactive for estrogen and progesterone receptor immunohistochemistry. The stromal cells can also label for CD34, WT1, actin or desmin. A striking majority of these occur in adult women (Am J Surg Pathol 2016;40:1538). 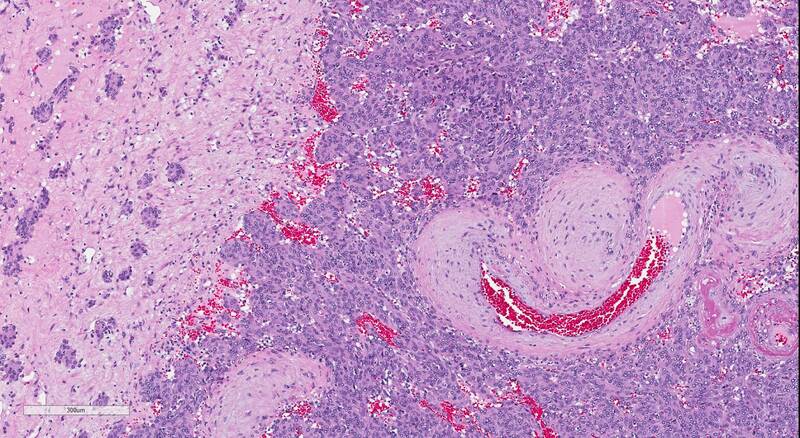 Juxtaglomerular cell tumors typically exhibit benign behavior, and excision is curative. C. Immunohistochemistry for renin is the best marker to distinguish juxtaglomerular cell tumor from glomus tumor, although a minor degree of renin positivity has been described in glomus tumor (Hum Pathol 2017;64:106). 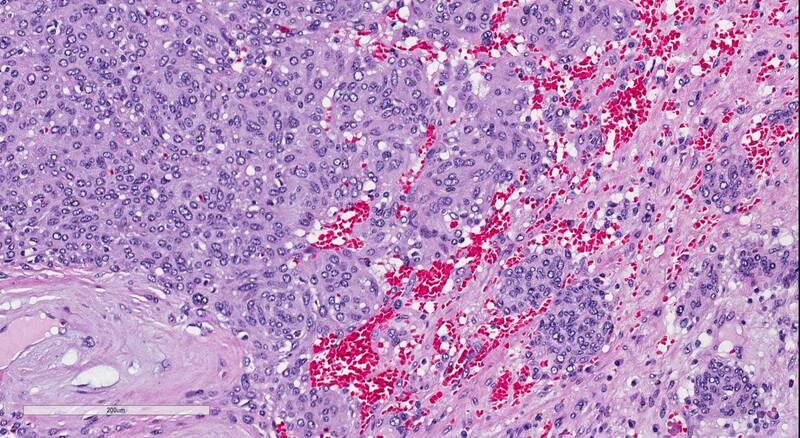 Although CD34 has been suggested as a helpful marker of juxtaglomerular cell tumor, some positivity has been reported in glomus tumor as well. KIT (CD117) has also been noted as a positive marker of juxtaglomerular cell tumor. Smooth muscle actin and vimentin are nonspecific for resolving this distinction.